There is still a lot of distressed home sales activity in Killearn Acres, but this month's report shows improvement in unit sales (the number of homes selling each month). As one of the most popular neighborhoods in Tallahassee, Killearn Acres represents the "median home price + 10%" crowd in Northeast Tallahassee. 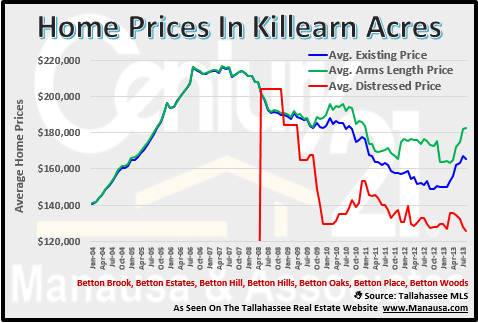 Thus far in 2013, there have been 36 homes sold in Killearn Acres with an average sales price of $171K, and with average home values coming in at $99 per square foot (the lowest value of any of the top 10 neighborhoods in Tallahassee). 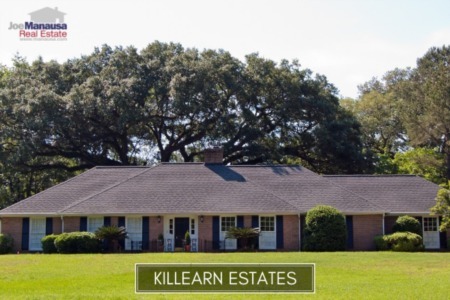 Currently, there are 14 homes for sale in Killearn Acres. The real estate graph below shows the average number of home sales is on the rise in Killearn Acres. Increased demand will help reduce inventory and will eventually result in rising values. 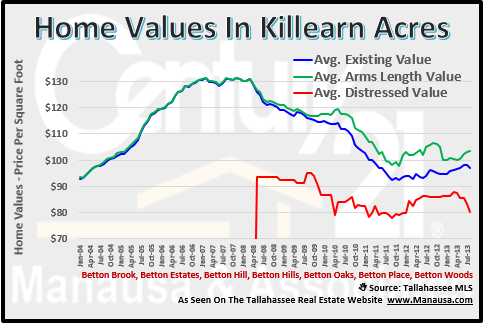 Unlike many of the other neighborhoods we have reviewed recently though, distressed home sales are on the rise in Killearn Acres. 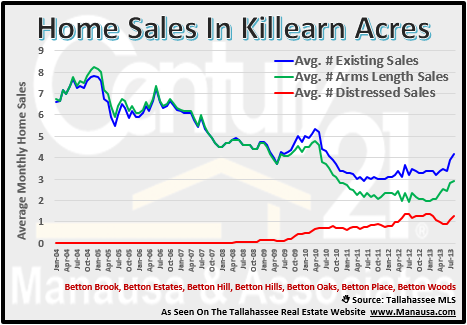 The average arms length home sales price in Killearn Acres (green line) is significantly higher than the average distressed home sales price (red line), which might be a cause for concern for Killearn Acres home sellers. Most of the recent reports we have seen for other neighborhoods have shown these values moving together, no apart as we see below. Home values are moving off a market bottom, but very slowly. If distressed homes continue to pour into the market, it is possible that we could see values decline even further. 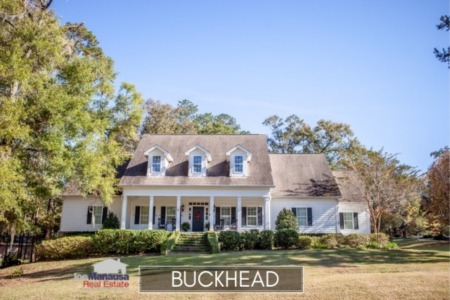 I suspect that there are many more upside down sellers waiting in Killearn Acres, but I think our market momentum will carry us through and I expect home values in Killearn Acres to begin to rise at an accelerated rate.